Lyman Lake sits an elevation of approximately 6,000 feet above sea level in Apache County, Arizona. Summers are beautiful with temperatures in the mid to high 80s, sometimes low 90s, but summer evenings dip into the high 50s and low 60s at night. Winters can be cold, and snow makes an appearance once in a while which really accentuates the natural beauty of this park. The phrase "Partly cloudy with a breeze" could be used to describe the most common type of weather experienced art this high country park. The sun makes an appearance most days, there's enough rain to keep it green, but not typically enough to ruin your trip! Unlike other parts of Arizona, all four seasons can be experienced here, and each one brings its own set of amazing features! January 79° F 20° F 0.75"
Note: Weather data is provided as a general guide only. Arizona State Parks assumes no responsibility for any loss resulting from the use of this information. Created as an irrigation reservoir by damming the Little Colorado River, Lyman Lake State Park is a 1,200-acre park that encompasses the shoreline of a 1,500-acre reservoir at an elevation of 6,000 feet. It is fed by snowmelt from the slopes of Mount Baldy and Escudilla Mountain, the second and third highest mountains in Arizona. Water is channeled into this river valley from a 790-square-mile watershed extending into New Mexico. 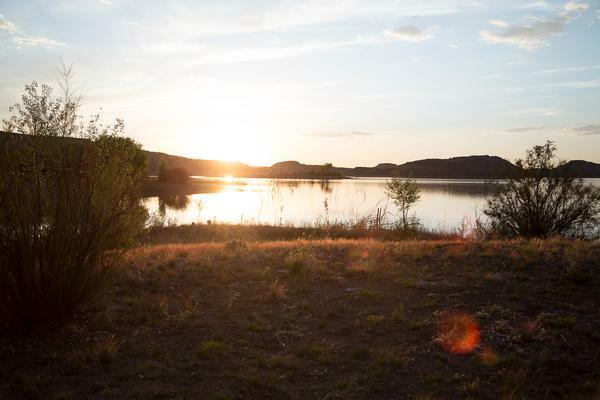 Lyman Lake is one of the few bodies of water in northeastern Arizona with no size restrictions on boats. The west end of the lake is buoyed off and restricted as a no wake area (5 mph). This allows the angler a chance at a variety of fish without the proximity of speedboats and water-skiers. The fishery consists of walleye, channel catfish and largemouth bass. The large remainder of the lake is open for all other types of water sports. Lyman Lake really comes into its own during the spring, summer, and fall. Summer days, with temperature highs in the 80s to low 90s, are perfect for fishing, swimming, leisure boating, water-skiing, hiking or just relaxing.